Yesterday, I mentioned again that I am increasingly concerned about the level of stock prices. Specifically, I said that, even if stock prices continue to go higher from here, which they might, I think that they will eventually crash back down below today’s levels — possibly far below. Even if stocks don’t eventually crash, but just move sideways, I think returns will be lousy for the next 7 years. In light of that view, several readers have asked why I am not selling my stocks or even going short (betting on a crash). After all, if I think that stocks might tank from here, wouldn’t this be a wonderful opportunity to make or save some money? That’s a perfectly reasonable question. * My portfolio is well diversified. My savings are composed primarily of low-cost index funds holding stocks, bonds, cash, and real-estate. If the stock market collapsed, this diversification would cushion the blow. It would also (I hope) keep me from panicking and selling near the bottom. (This is a real risk, one I occasionally succumbed to early in my investing life.) I also have enough of my portfolio in cash that, if the market does crash, I’ll be able to rebalance into stocks at a much lower level. * I don’t invest money in the stock market that I think I will need to use in the next 10 years. The stock market does crash occasionally. And the last thing you want is to have to sell your stocks during the period when the market is “crashed.” If the stock market crashes permanently, or we get in a Japan-type situation in which stocks remain clobbered for decades, then, yes, I’ll be bummed I didn’t sell some now. But otherwise I expect any crash to be relatively temporary, just as the crash of 2008-2009 was. * There’s nothing else to buy: The outlook for other asset classes over the next 10 years is no more attractive than it is for stocks (and, in some scenarios, it is worse). If interest rates ever rise back to normal levels, bonds will get obliterated. Cash is earning nothing. Real-estate is also expensive by many measures. So selling stocks and moving to, say, bonds, might be just leaping from the pot into the fire. 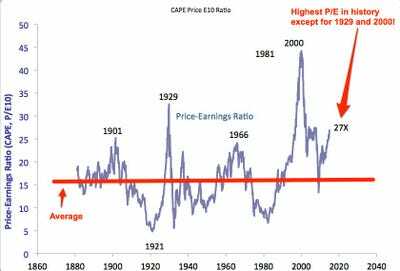 * There is a reasonable likelihood that inflation will accelerate at some point over the next decade, and stocks are actually a good hedge against inflation. Unlike bonds and cash, stocks are “real” assets. They represent an ownership share in an enterprise whose business will adjust to inflation by raising the nominal level of prices, wages, and profits. Stocks don’t necessarily do well in high-inflation environments (stocks were flat in nominal terms from 1966-1982 and dropped considerably after adjusting for inflation). But they do better than bonds, which get demolished. * I have learned the hard way that market timing is very difficult. It is really hard to correctly time major market reversals. (I learned this as an analyst during the dotcom crash in 2000, and my mistake cost me and my clients a fortune.) And it is really, really hard to correctly time two major market reversals in a row, which is what I would have to do for it to be a smart idea for me to dump my stocks now. Specifically, if I sell now, and the stock market does, in fact, crash, I will then have to figure out the right moment to get back in. (Given inflation, remaining on the sidelines forever would be a disaster.) If the market drops, say, 25%, it will be because things look so terrible that it will look like the market is going to drop another 25%. And who wants to buy only to have the market crash another 25%? If I set a hard “buy” floor at 30%, meanwhile, the market will probably drop 28.8% and then skyrocket, leaving me alone at the station as it rolls away. * If I sell now, I’ll have to pay taxes. Thanks to my indexing strategy, I have captured every point of the move up from the 2009 market low (I also captured every point of the crash, so I don’t say this to gloat). When markets crash, I also buy more of them, so I was lucky enough to get some new stock in 2008 and 2009 at much lower levels than today. So if I sell now, I’ll have some capital gains taxes to pay. For taxable investors, unlike fund managers who get judged on pre-tax returns, taxes are a real and important issue. The market would have to drop at least 20% from where a taxable investor sold — and the taxable investor would then have to get back in at that level and ride the market back up — for the investor to save money selling at the top. * Oddly, the best thing that could happen for my long-term stock returns would be for the market to crash 50% and then stay crashed for 5-7 years before going up again. I reinvest dividends. So if the market drops by, say, 50% over the next year, and then stays at, say, DOW 7,500 for 5-7 years, the stocks I own will reinvest 5-7 years worth of dividends at half the price per share than I am paying today. This will result in my accumulating twice as many new shares over the next 5-7 years as I will if stocks stay where they currently are. Then, 5-7 years from now, when the stock market finally begins to recover, these new shares will act as a sort of portfolio turbocharger, boosting my returns. In short, the only thing I am really worried about as a stock-market investor is a permanent crash. And if the stock market crashes permanently, it will likely be because the United States has experienced a communist revolution in which all private assets are seized or some other cataclysm. And if that happens, I’m going to have bigger things to worry about than stock prices.